I just want to take a bit of time to discuss one of the speculative hands we have talked about throughout this guide. The suited A-x hand. That is an Ace with any supporting kicker card of the same suit, so for example As-9s, Ad-3d, Ah-Jh, Ac-5c etc. I do like playing A-x suited because you are drawing to the nut (best) flush. When it does hit there is a possibility that someone else also hits a lower flush, which can often mean fireworks for the pot and potential winnings. However you really do have to be very careful with it, just like all speculative hands, and really think about every situation you play it in. There are many times you have to be disciplined enough to fold this great looking hand. The chances of you hitting a flush are not that high, so in order to justify playing it we need to get good pot odds. That is why it is best played in a situation where you can get in cheap with a limp or small raise and play against multiple opponents, in fact this is one of the only times I advocate trying to play a hand against more than one opponent. This can be tricky in the middle and late stages of the tournament as the blinds are getting higher and it may be that it just costs too higher percentage of your stack to be involved in these sort of hands. So you will probably find that you cannot play these hands as often as the early stages of the tournament. I will usually limp with A-x suited in the early and middle stages unless there is a raise in front of me. Then it is time to fold. Of course I sometimes mix it up to keep my opponents guessing and will sometimes enter with a small raise or call a small raise just so my opponents can’t pick up any betting patterns from me playing certain hands the same way all the time. This hand is usually a fold for me approaching the bubble and even when into the money I am careful not to play it to any significant raises. One thing I just want to emphasise. This hand is very very different to A-x UNSUITED. Do not be tempted to confuse the two hands. I absolutely hate playing A-x unsuited. To me this hand will get you into trouble 9 times out of 10, it’s not even worth a limp. I have seen way to many times players call all the way to the river with A-5 after hitting an Ace and get beat by a stronger kicker like A-8. When looking at A-x unsuited you really have to think about fold equity and simply discard it. Players love to play anything with an ace in their hand. What that means is that you are more likely to be playing against someone with an ace in their hand and so if you are playing a weak Ace (A-10 or lower) then even if you hit an Ace, there is a high chance that someone has you beat with a higher kicker. That is why when we play A-x suited we are not interested in hitting our ace to make a pair, we are only interested in a monster hand. We want to hit our flush and then we have the absolute nuts. The only possibility that we would be beaten is if all the community cards were close together and there was a possibility of a straight flush or if the board was paired and someone had hit a full house, highly unlikely but keep an eye out for it all the same. If the flop comes and I haven’t hit at least two cards of my suit then I am folding to any bet (even if an Ace comes on the flop). If no cards of my suit have come, I cannot make a flush in this hand, so there is no need for me to be there. If 1 card of my suit has come then I would need to hit consecutive runner runner cards of my suit on the turn and river to make my flush, which is a long shot to say the least so again I am out of there. 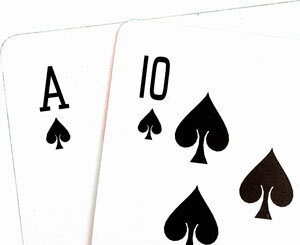 If two cards of my suit come on the flop then we have some thinking and calculating to do. If there is no betting then I would definitely take the free card(s) to see if I can hit the flush. If there is a bet then I would consider the pot odds and if they are favourable then I would call. In the last article I talked about also considering the impact to your stack before chasing cards. This is also very true for chasing A-x suited type hands, however this shouldn’t really be a decision after the flop, because if it is going to have a significant impact on your stack, then you shouldn’t be playing the hand in the first place, the hand should be in the muck before you have committed any chips to the pot. Big Potential or Big Trouble? I love playing A-x suited because of the potential of the hand. If you get the flush you know you have the nut flush. I remember plenty of times beating lesser flushes … those are great and lucrative! Sometimes I have had the luck to flop the nut flush. Those can easily turn into a double up if your opponent has caught something. Even someone with a King in the flush suit might chase to get his King high flush. At this point it’s all good! Yes the potential of a hand like A-x suited is BIG but I constantly remind myself that it can also get you into BIG trouble if misplayed.